Drawing on court depositions, newspaper coverage, her mother’s unpublished novel, and interviews with family and friends, she uncovers the story of a con icted and troubled activist, socialite, and community leader. 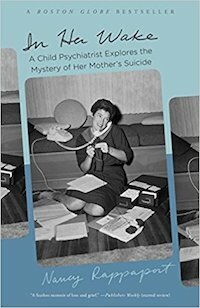 Rappaport explores the impact of her mother’s suicide from the perspective of a daughter, psychiatrist, wife, and mother of three — illuminating in the process the complicated nature of loss, reconciliation, and healing. Inspiring, honest, and engaging, In Her Wake is a powerful testament to a woman’s search for answers, and a potent reminder that love outlasts death. Dr. Rappaport’s latest book, The Behavior Code: A Practical Guide to Understanding and Teaching the Most Challenging Students, with Jessica Minahan. Based on a collaboration dating back nearly a decade, the authors—a behavioral analyst and a child psychiatrist—reveal their systematic approach for deciphering causes and patterns of difficult behaviors and how to match them with proven strategies for getting students back on track to learn. The Behavior Code includes user-friendly worksheets and other helpful resources. Teaching is an art, but it’s one that can be improved with science. 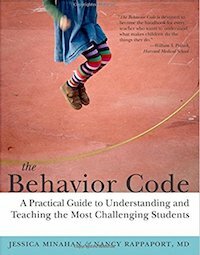 Based on what we have learned in the field of psychology, The Behavior Code gives teachers the tools to transform the behavior patterns of some of their most challenging students. By using this essential book, teachers—instead of punishing or writing off troubled students—can get them onto a path for success. The Behavior Code is truly a godsend. Concisely written and easy to read, this book offers a framework for creating successful behavioral plans. I predict that once teachers and principals begin to apply the authors’ approach for understanding and changing problematic behavior, they’ll never look elsewhere for help again. Buy it, read it, use it, read it again and again—and pass it on! This book is an essential guide for teachers and school personnel who find themselves in daily contact with students presenting with difficult behaviors. The authors outline an intervention procedure that is easily implemented in a busy classroom with multiple demands. Too often, behavioral intervention plans require so much attention to detail that teachers soon decide to disengage. Not so with the FAIR plan. By providing clear instructions and helpful examples, the authors promote a plan that prevents inappropriate behaviors while reinforcing socially acceptable alternatives. The Behavior Code needs to be read by all teachers, counselors, administrators, and parents! The message is simple: our student’s challenging behaviors will continue if we only use punishments or rewards. Our job as caregivers is to understand our students’ dilemmas and teach them better coping strategies. The authors do not shy away from difficult topics, such as the students who say, “I don’t care,” or who demonstrate sexualized behavior. This book is complete with supportive advice for teachers dealing with the challenging student and worksheets for organizing one’s own teaching around the FAIR Plan thoroughly described in the book. Waste no more time spinning your wheels with challenging students; allow yourself to be guided by the interventions articulated so well in the pages of this book. The Behavior Code is filled with wise and very concrete suggestions for K-6 educators and school counselors. This book insightfully illuminates the nature of anxious, oppositional, withdrawn, and overly sexualized behaviors. And it provides detailed, helpful suggestions that support school personnel anticipating and addressing these kind of challenging — and often, overwhelming – behaviors. A practical guide that will help teachers understand and improve their students’ behavior and reduce the stress on everyone. This book is useful for experienced teachers and a great introduction for the student teacher or new school consultant. I was especially impressed by the originality and creativity of the materials provided and the many sample recommendations. Teacher and school mental health consultants will find this book a major resource; it’s eminently instructive and practical in guiding their work with students who have emotional and/or behavioral problems. The very experienced authors combine functional behavioral analysis with an in-depth understanding about four common types of challenging students, and provide a wealth of strategies for optimally changing, teaching, and interacting with such children. The Behavior Code presents a cogent, succinct, highly readable support system for teachers, behavior specialists, and site administrators. Authors Rappaport and Minahan employ the process of Antecedent/Behavior/Consequence data collection coupled with case studies to illustrate its practicality and application. The manual is highly useful for staff professional development related to student behavior support plans and behavior intervention plans, both of which support improved student learning.